RONKONKOMA, Long Island (WABC) -- Beautiful weather outside on Sunday makes for a busy day inside Carvel in Ronkonkoma, but the workers are on edge. "I'm just nervous," said Yany Chen. Chen wasn't there on Saturday night, but two of her coworkers found themselves held up. 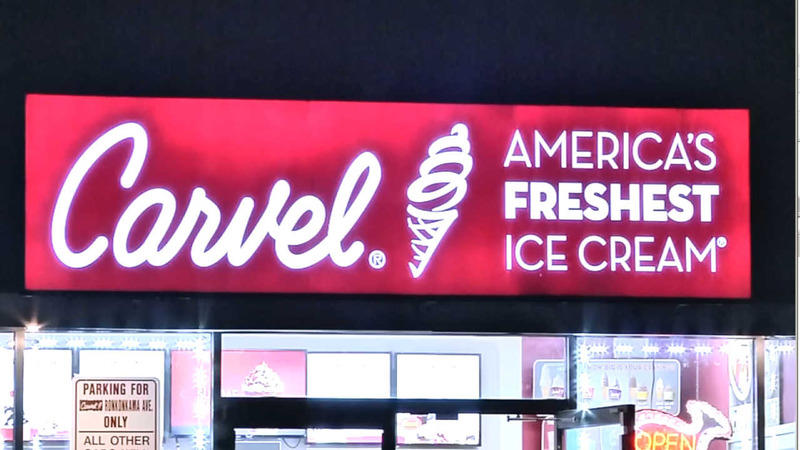 The Carvel on 290 Ronkonkoma Avenue is the latest victim of a robbery with a machete or large knife. "I heard about another in Nassau County, but a Carvel had a robber also, like a few weekends ago," Chen adds. "I didn't figure they would get this far out here," says business owner Zeke Sndy. This marks the seventh robbery of its type on Long Island. The first robberies were in February in Seaford and South Farmingdale. The blade-wielding thief hit again, crossing county lines, including last week in Carle Place. Last week, investigators connected all of the robberies. "The subject description and M.O. and the weapon used, we made the connection that ours would be related to the pattern," said Detective Lt. Shaun Spillane. The thief seems to have found his sweet spot, hitting mostly Carvel ice cream shops. Each franchise received an email from corporate, warning each owner and reminding them of security procedures. Police in Suffolk and Nassau have stepped up patrols, but it has not stopped the hold-ups, so businesses wait and hope they are not next. "I just keep the lock on the door, but in the daytime, I should be okay," Chen says. Investigators have not said for sure if the Ronkonkoma robbery is connected to the others. So far, no one has been hurt, but investigators are anxious to find the suspect, before he escalates.